MARIUPOL, Ukraine -- In a stuffy basement a block off Prospekt Lenina (Mariupol’s main street, which is named after Vladimir Lenin), about 30 Mariupol residents recently gathered for a lesson in democracy. Ukrainian women embroider a map of Ukraine with the different flags of the regions in the country during a pro-Ukranian meeting in the southern coastal town of Mariupol. It was raining and thundering outside. And, like during most storms in Mariupol since the war began in spring 2014, it wasn’t immediately clear if the sounds of thunder were from the storm or from fighting on the front lines in Shyrokyne—only a 20-minute car ride away. “Democracy is not a perfect thing,” said Maksim Borodin, a computer repairman and one of the leaders of the pro-democracy group called “Together,” which had organized the meeting. The audience fanned themselves to keep cool in the hot, humid basement as he spoke. “But we have to learn the government is not the authority,” he added. The mission of Together (which has about 80 total members) is to teach Mariupol’s residents about the norms of democratic culture, such as freedom of information and the belief that government works for its citizens, not the other way around. The group also teaches citizens not to tolerate bribery and corruption, or thuggish tactics of coercion meant to silence political opposition—all hallmarks of Ukraine’s post-Soviet democracy. “Mariupol is caught between the past and the future,” said Peter Andrushchenko, one of the group’s leaders, speaking to the audience. “The city council site must be open and accessible by all,” he added. Many citizens in Mariupol have been dissuaded from participating in their country’s political process due to 70 years of Soviet rule and a 25-year span of corrupt oligarchies—intermittently interrupted by revolutions in Kiev. The lesson learned by many is referred to as the “ostrich mentality”—keep your head down and out of trouble; it’s not worth being singled out trying to effect change that most likely won’t succeed. “Many of Ukraine’s civic laws and local governments still operate under the rules and along the lines of the Soviet days,” Borodin said. Additionally, the failed promise of democracy to improve living conditions has spurred some residents to retain pro-Russian sympathies out of nostalgia for the Soviet era, when pensions and politics were perceived to be more stable. “Almost all of our parents have pro-Russian views,” said Igor Peftiyev, 30, an insurance broker. Andrushchenko’s basement pro-democracy lecture, for example, provoked some pushback. “How can you control the authorities?” one old man in the crowd yelled. He had a gray beard and wore a flat cap. Among Mariupol’s millennials, opinion is also split about the likelihood of reform. Some claim the younger generations, for whom the Soviet Union is a secondhand memory, are more exposed to the West through social media and the Internet and will consequently demand changes that their parents and grandparents have been reluctant to pursue. “Our parents grew up in the USSR,” said Katerina Altunina, 19. Others, however, say the inescapable threat of war has stifled progress, spurring the prioritization of personal security over pushing for political reforms. “When you are safe, you can have an opinion,” said Serhiy Zubrev, 30, an engineer. In August 2014, as separatist attacks ramped up on the outskirts of Mariupol prior to the first cease-fire on September 5, the civic group New Mariupol organized a human chain on the outskirts of the city as a symbolic call to end the war. The event drew more than a thousand people, highlighting what the group’s leaders say is a new trend of civic participation in Mariupol that did not exist prior to the conflict. “Mariupol is not a city where people go out and go to meetings; it was unusual to have that kind of civil society reaction,” said Ivan Syniepalov, a spokesman for New Mariupol. New Mariupol’s missions are diverse, including military training for civilians to prepare for urban warfare, babushka volunteers who sew ghillie suits for Ukrainian snipers and pro-democracy classes in local elementary schools. “We want our children to grow up in a Ukrainian environment, not Russian or Soviet,” Syniepalov said. Last year’s revolution—centered in Kiev’s central square, the Maidan—has spurred national anti-corruption campaigns, the sacking of oligarchs from political positions and a house-cleaning of corrupt officials across Ukraine’s different national ministries. Even Kiev’s notoriously corrupt traffic police have had a top-to-bottom makeover, including a comprehensive personnel change, new uniforms (patterned off U.S. police) and U.S. law enforcement training. The 2014 revolution also spurred a volunteer activism awakening across the country. Numerous anti-corruption and reform-focused civic groups have formed, as well as volunteer groups that collect and transport equipment and supplies to soldiers on the front lines, and civilian volunteer battalions—formed out of protest groups active in the Maidan—that still actively fight in the Donbas. “Civic groups like ours are a victory of the Maidan,” Andrushchenko said, referring to the 2014 revolution. Yet, across the country, local governments remain largely unchanged, still comprising officials elected before the revolution. Outside of Kiev, many citizens’ lives have not been positively affected by the 2014 revolution. The war in the Donbas has killed more than 7,000 Ukrainian soldiers and civilians and has displaced almost 2 million people. And an economic crisis has collapsed the country’s currency—consumer price inflation is forecast to end 2015 at 30 percent—and led to a sharp decline in GDP. “There is a feeling in Ukraine like nothing changed for the better,” said Hennadiy Korban, 55, in an interview with The Daily Signal from his Dnipropetrovsk offices. Korban is a Ukrainian businessman and former deputy of oligarch Ihor Kolomoisky, whom Ukrainian President Petro Poroshenko removed as governor of Dnipropetrovsk earlier this year. “Pensions have plummeted from $500 to $150 a month,” Korban said. “It was good to take out Yanukovych,” said Soslan Bekoev, a lawyer in Dnipropetrovsk, referring to deposed Ukrainian President Viktor Yanukovych. 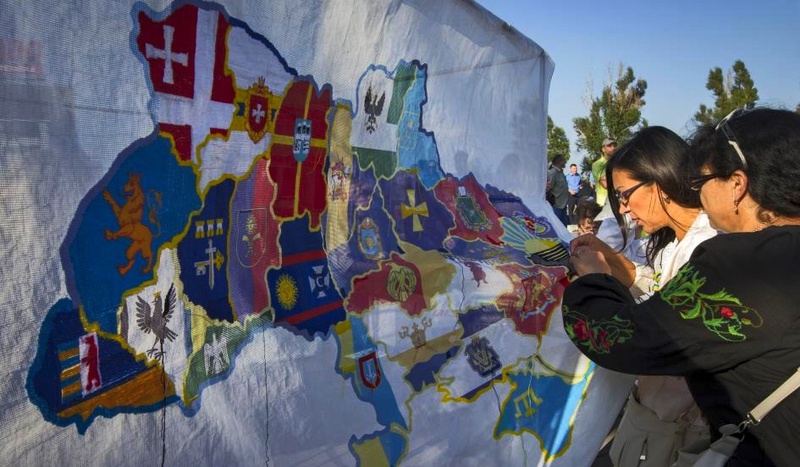 On Oct. 25, Ukraine will hold national elections, including all local government positions. Many consider the October elections a key test of Ukraine’s democratic reforms and a bellwether of the country’s chances for a prosperous and peaceful future. “The old political ways won’t come back; people can now see the difference,” Korban said. There are concerns that if the elections do not produce significant changes, internal tensions could reignite. “Our country wouldn’t survive another revolution,” said Svyatoslav Oliynyk, a former deputy of Kolomoisky, in an interview. Decentralization of governmental powers will be one of the key campaign issues this October. On July 16, the Verkhovna Rada (Ukraine’s parliament) overwhelmingly approved draft constitutional amendments to decentralize governmental power. One key element of the amendments was to give local communities access to their own bank accounts for discretionary spending. Back in the Mariupol basement, Andrushchenko extolled the value of participating in the local democratic process. “Nobody can force you to change,” he said.